Feline Computed Tomography...CT scans, or Computed Assisted Tomography (CAT) scans, have been used since the 1970’s in human medicine, but it took more than another 20 additional years for them to be utilized consistently in veterinary medicine. Once the pet-owning public became aware of the procedure’s availability and the prices got more affordable, a lot of this technology got more widespread use with animals. Prior to conducting a CT scan, a cat must first be placed under anesthesia to ensure that it remains stationary during the procedure. Once immobilized, the animal is placed on a bed in the CT scanner, which scans the problem area in intricate detail, producing thin, layered images. The CT will give a cross-sectioned image of a body part similar to slices of bread. Each slice will represent an area of the body part and they can be viewed individually without having the other slices superimposed over the area of interest. 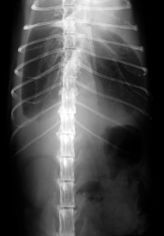 An X-ray shows a full exterior image of an organ while a feline computed tomography (CT) scan allows vets to view the interior tissue and any problem areas within. For example, an X-ray of the liver will show a very homogenous white structure but not show the gallbladder, even though it’s between liver lobes. With the CT, the gallbladder can be seen as a separate structure. Also, an x-ray cannot distinguish between fluid and soft tissue, and many times, it cannot distinguish between normal soft tissues and tumors. Because a CT scan can make that distinction, it has become a good diagnostic tool for many feline ailments. 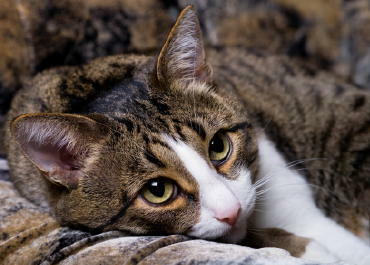 The most frequent use in feline patients has been in evaluating abnormalities of the head which helps vets determine the causes and extent of diseases that affect the brain and also the extent of diseases that affect not only the brain, but the nasal passages, the spinal column, and other internal organs. This information is used in helping determine prognosis, as well as for planning any radiation treatment or therapy that may be needed. So, the scans are often used to detect brain tumors and hemorrhages and also to diagnose nasal cavity diseases and cancers. For example, in vaccine-induced sarcoma, the cat will show with a lump dorsal to the scapula (in its back). A scan will better define the true extent of the mass and it can then be treated with radiation therapy as well as scanned again after radiation to see if the tumor is still growing. Because CT scans produce better tissue contrast resolution than X-rays, the diagnosis can be more accurate and can pinpoint problems before the treatment program. Today, there are a number of Veterinary Imaging Clinics that perform the feline computed tomography procedures but the cost of the machine is a major investment, so many vets refer feline patients to a nearby facility for the actual scan. Plus, there are some drawbacks that have to be discussed with the pet owners. 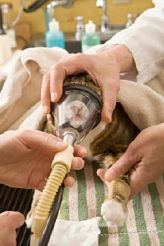 (1) Anesthesia has to be given, and for an old or sick cat it’s an added physical stress. (2)Some tests require an intravenous contrast media (such as iodine solutions that better define tumors) and this can produce ill-effects. (3)It’s an expensive procedure. So, costs and risks enter into the equation. Although the images produced by feline computed tomography scans are more complete than those provided by other radiological methods, they are not necessarily appropriate for every situation. They will never replace some chest and abdominal x-rays. But at least it’s another option that is available for specific and more complicated cases.